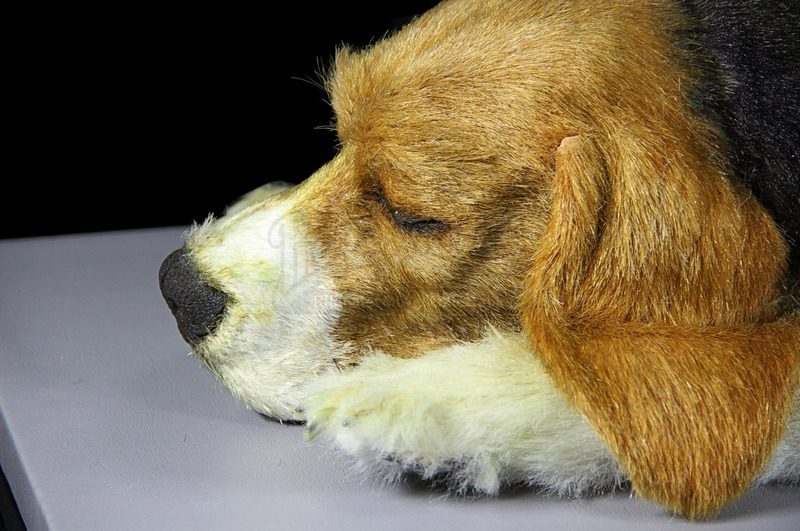 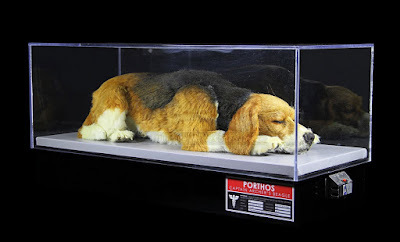 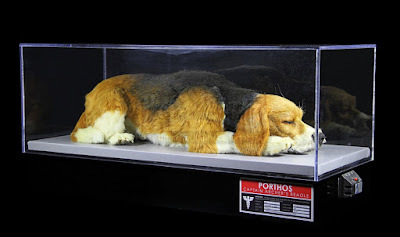 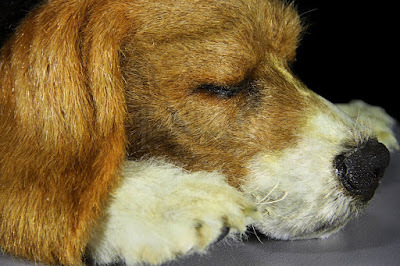 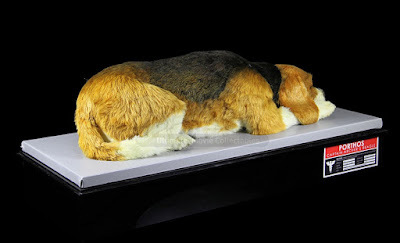 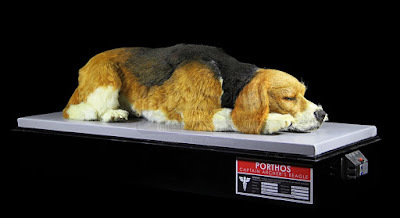 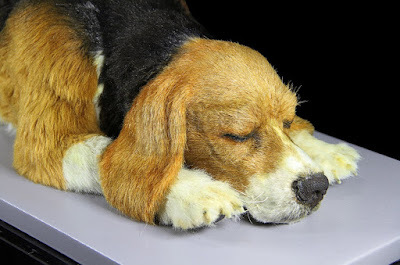 Star Trek: Enterprise Porthos Puppet from "A Night In Sickbay"
Presented below are some detailed photos of a rare life-size puppet of Captain Archer's beloved pet beagle Porthos that was screen used in the memorable 2nd season Star Trek: Enterprise episode "A Night In Sickbay" (first airdate: Oct. 16, 2002); in which Porthos almost dies after exposure to an alien virus. 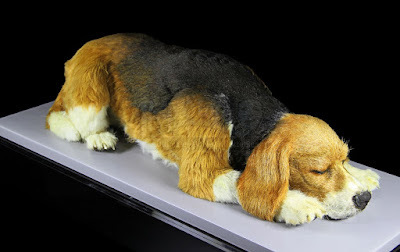 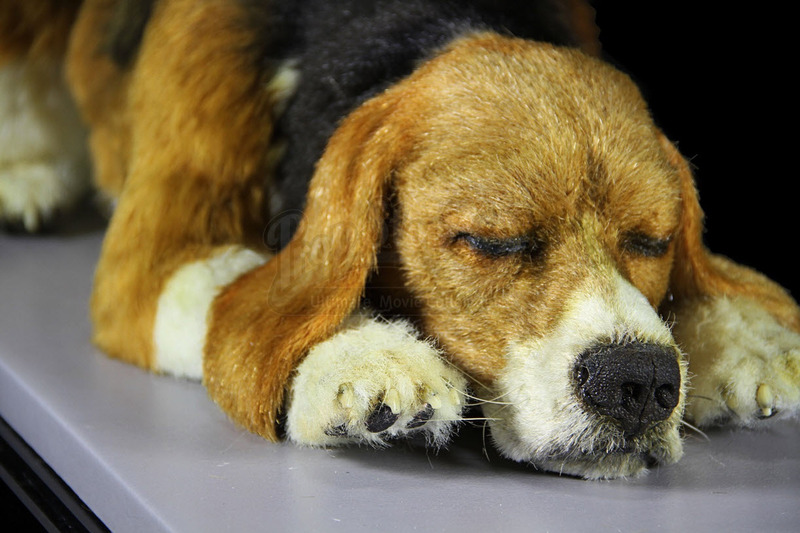 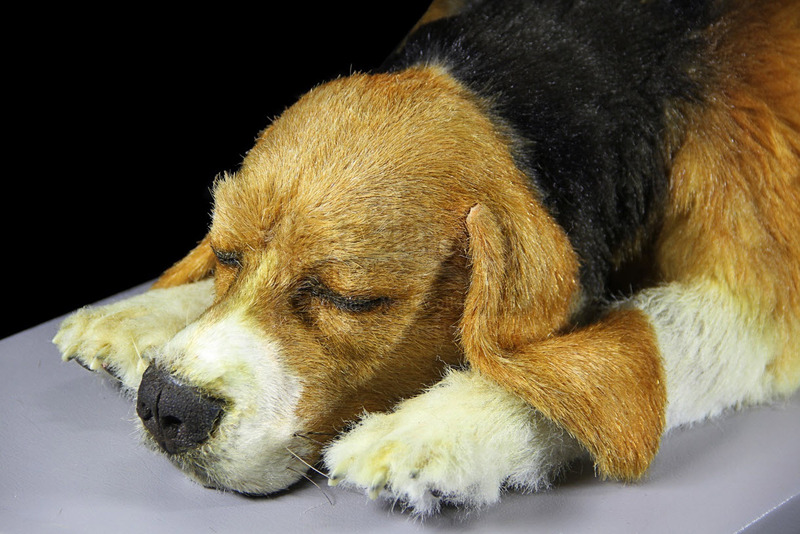 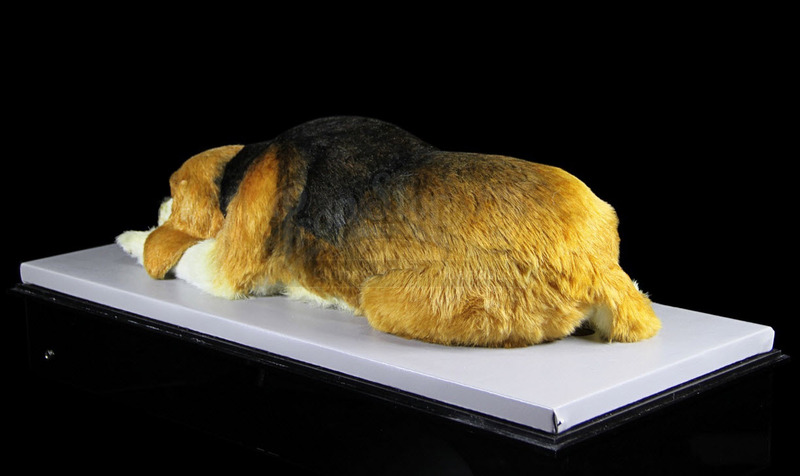 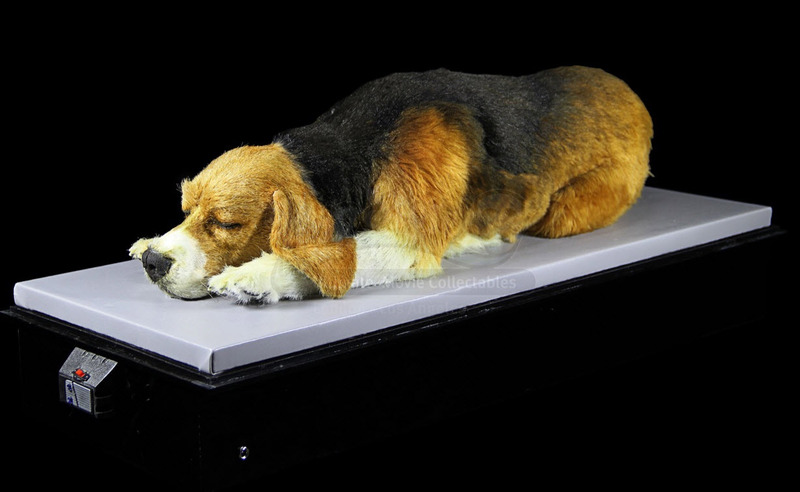 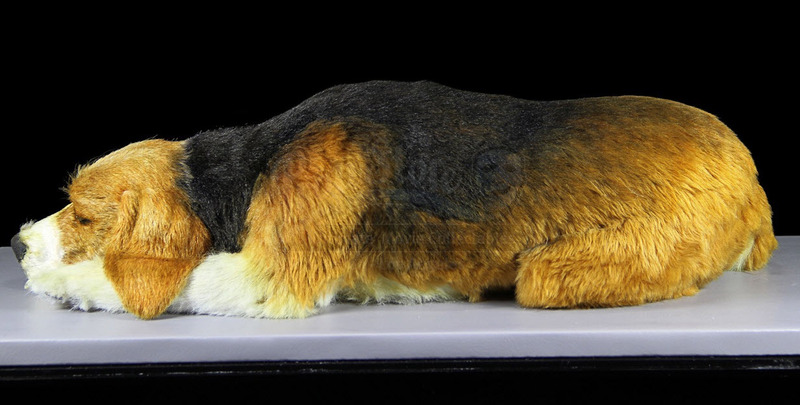 This puppet features incredible artistic detail and is equipped with a set of internal air bellows to simulate breathing activity that are electronically powered via cables running from its stomach. 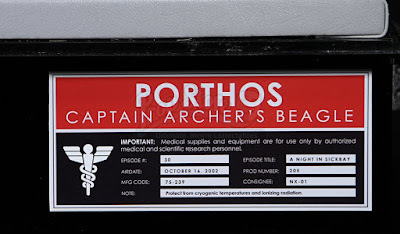 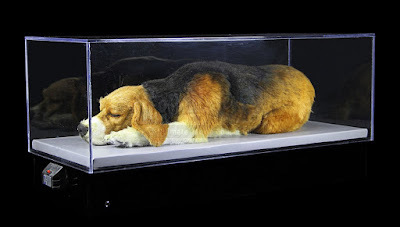 The overall display includes a custom made medical quarantine tank and measures approx. 12.5" x 30" x 14.25". 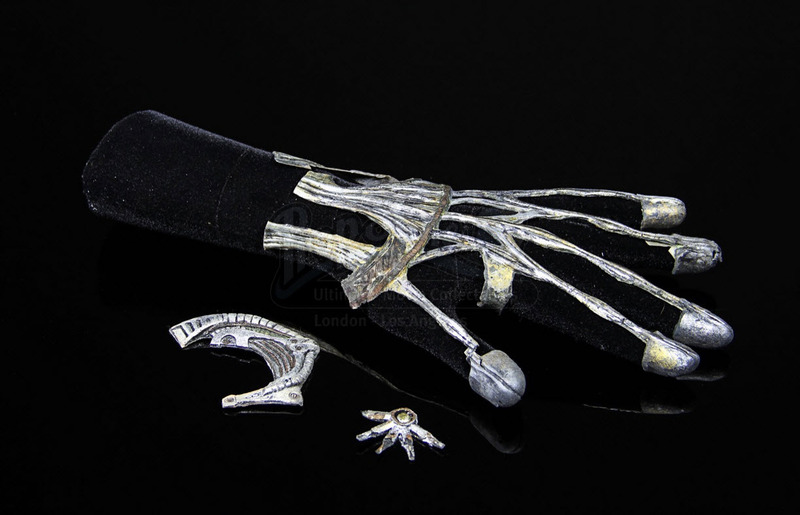 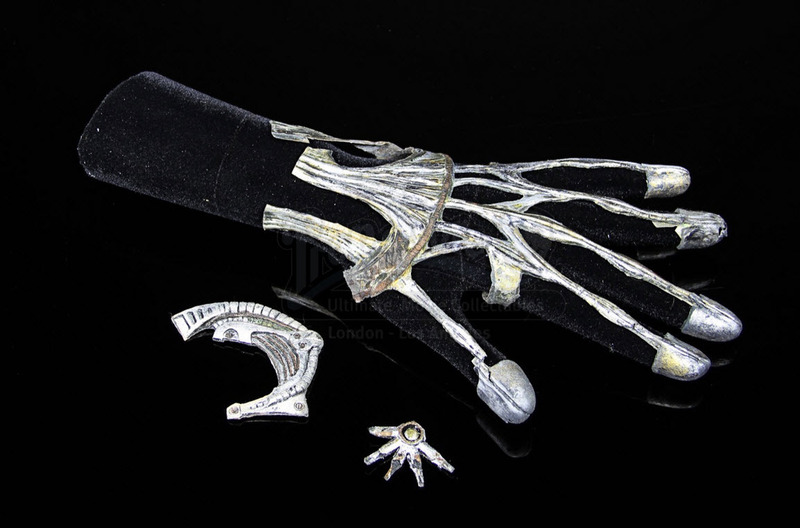 This iconic prop was recently offered as Lot 359 in the Prop Store of London's September, 2015 "Treasures from the World of Film & Television" entertainment memorabilia auction that took place at the ODEON BFI IMAX theatres in Waterloo, London, England; where it realized a high bid of £2,500 (approximately US$3,825), not including the 29% buyers premium. 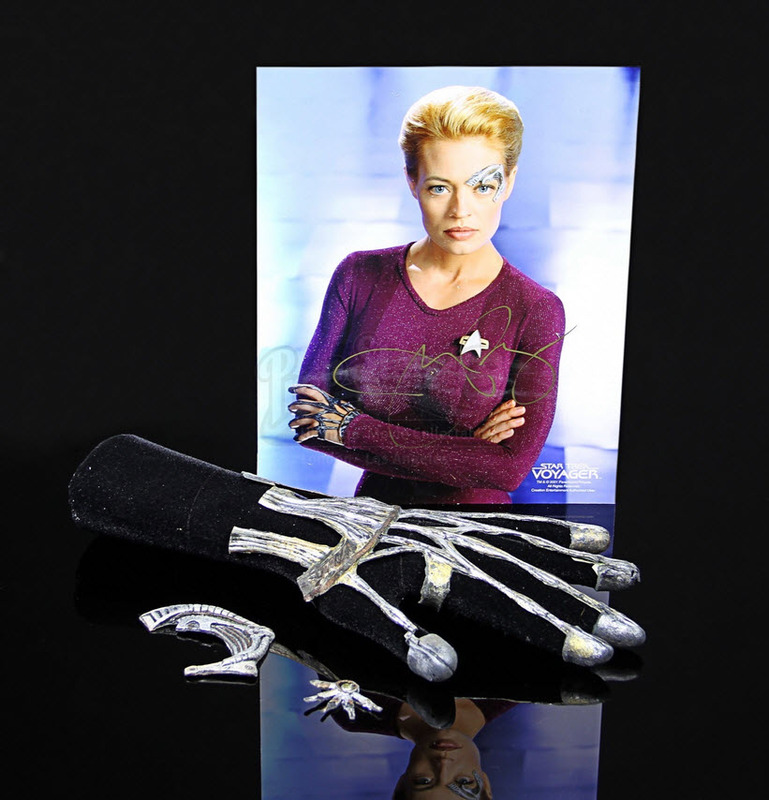 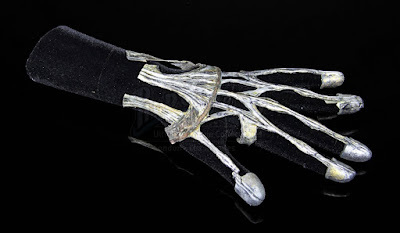 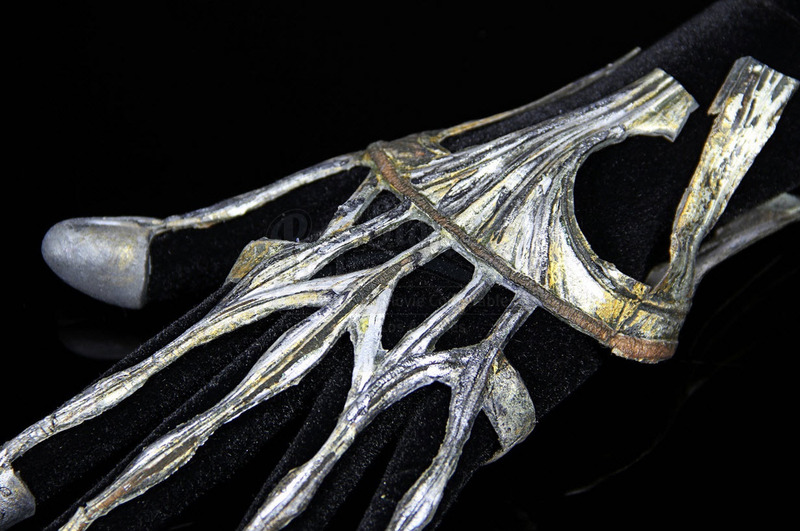 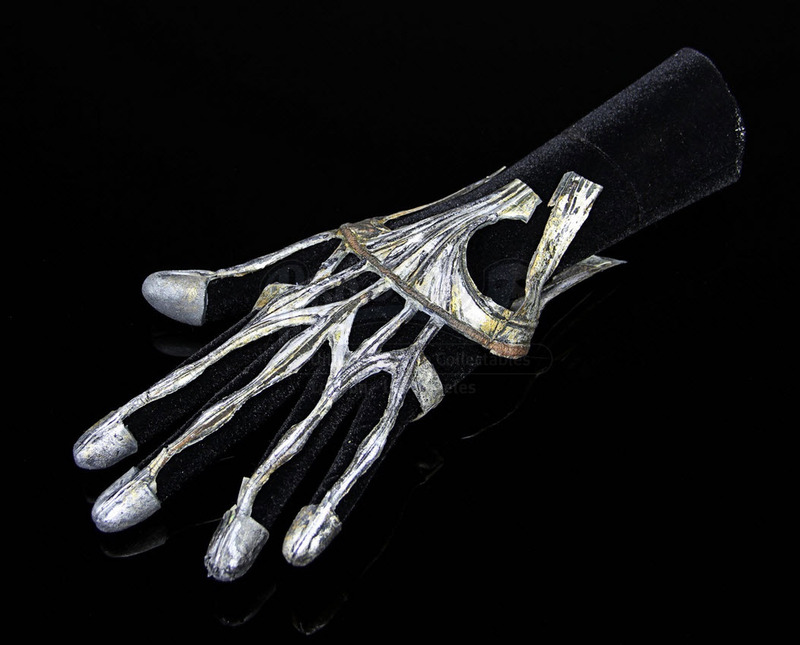 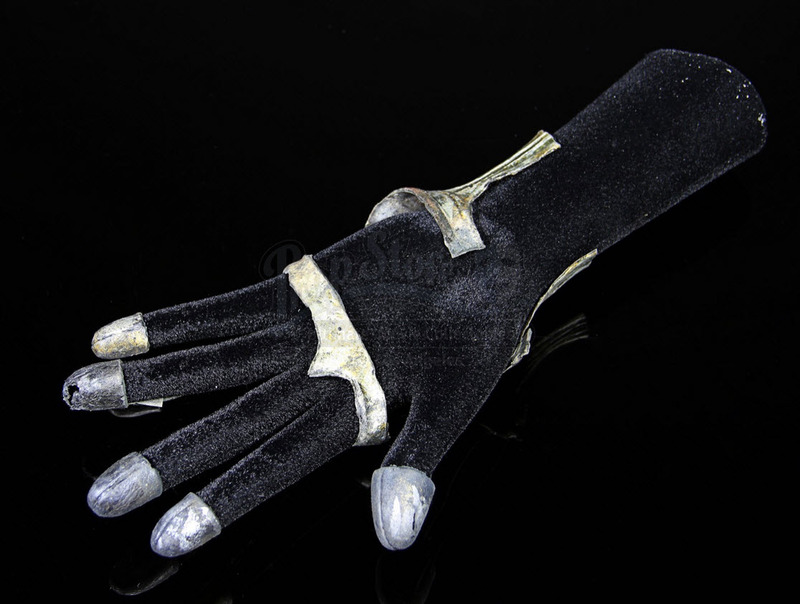 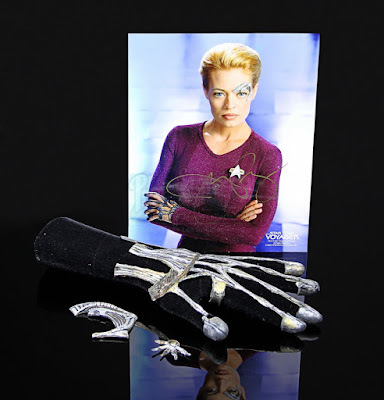 Presented below are some detailed photos of a rare set of screen worn soft latex Borg hand and face appliances used by actress Jeri Ryan in her portrayal of Seven of Nine on Star Trek: Voyager (UPN, 1995-2001). 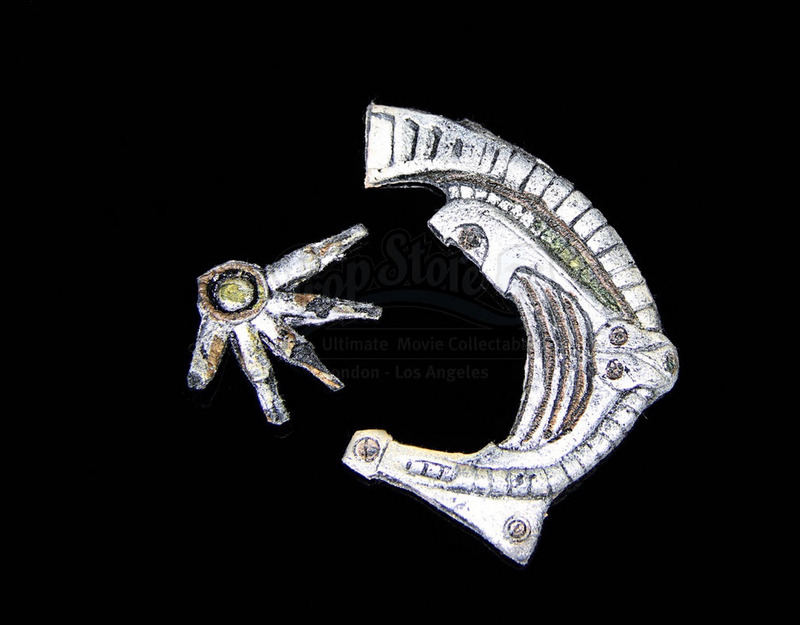 This particular set is attributed to the 6th season episode "Unimatrix Zero" (first airdate: May 24, 2000) and features a metallic steel and brass-effect paint finish. 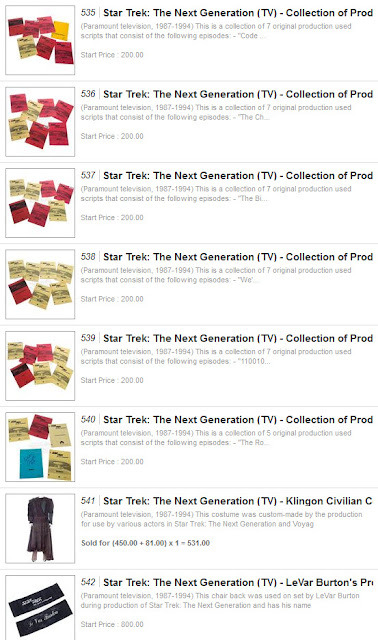 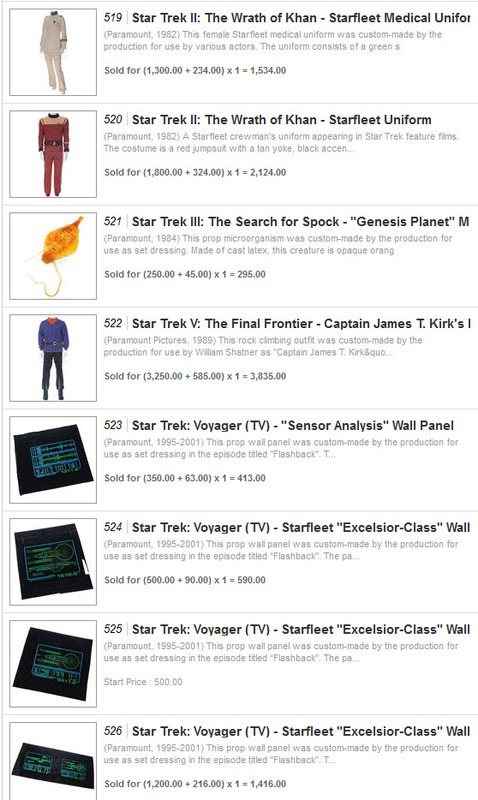 Presented below is the complete set of final prices realized for the 39 lots of Star Trek memorabilia that were offered in the Day 2 live session of the ScreenUsed Winter 2015 Movie Prop and Wardrobe Auction; which took place last month on November 21st via online bidding at iCollector.com. 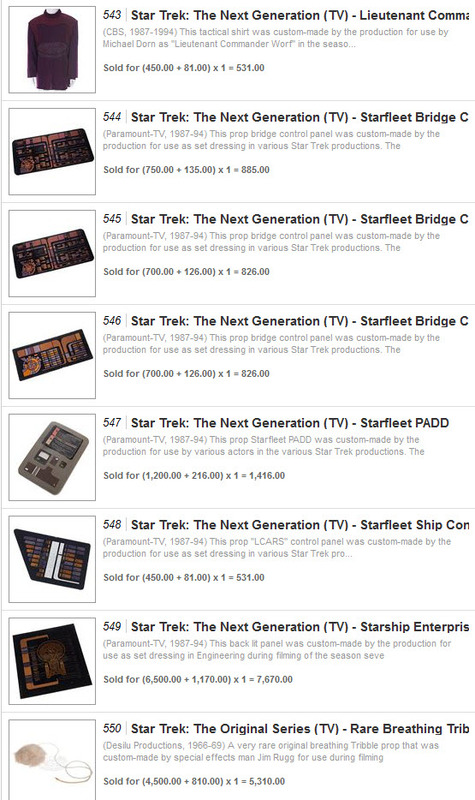 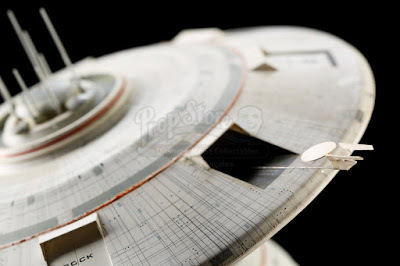 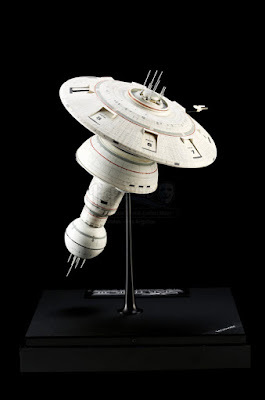 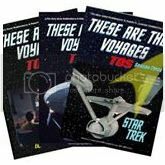 The highest price witnessed for a Star Trek item in the sale was $7,670 for a Starship Enterprise Backlit LCARS Panel from Star Trek: The Next Generation which featured a top view of the Enterprise-D Galaxy Class vessel. 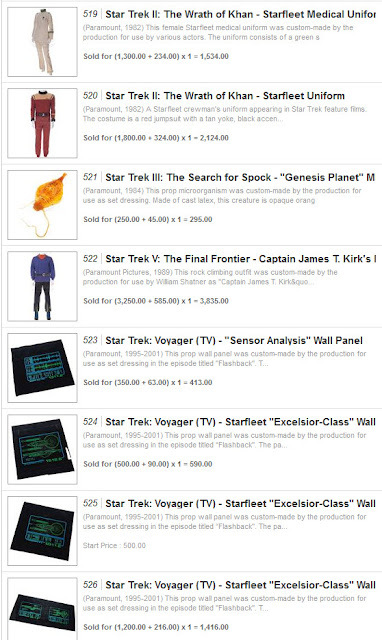 A Rare Breathing Tribble from Star Trek: The Original Series realized $5,310, and a William Shatner screen used Captain Kirk Rock Climbing Outfit from Star Trek V: The Final Frontier sold for $3,835. 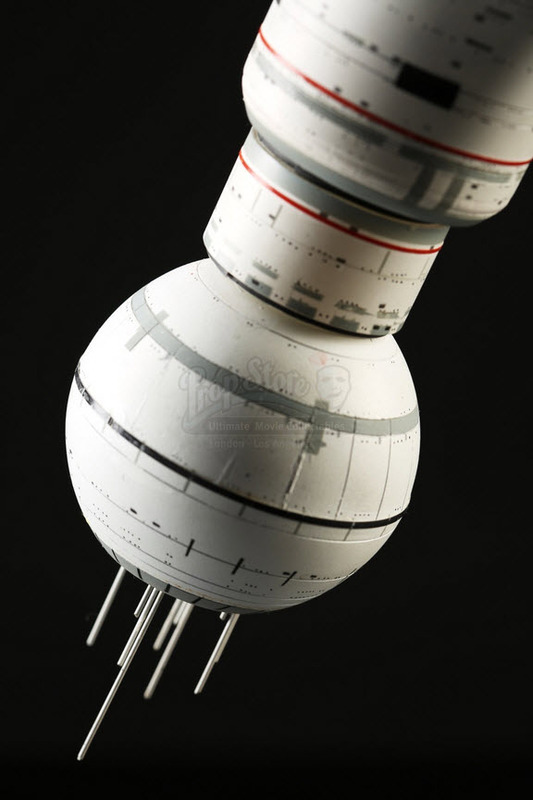 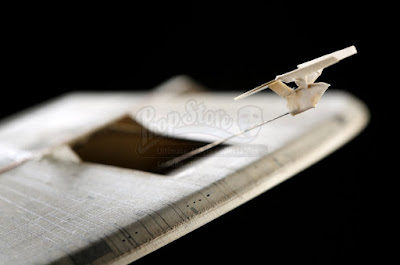 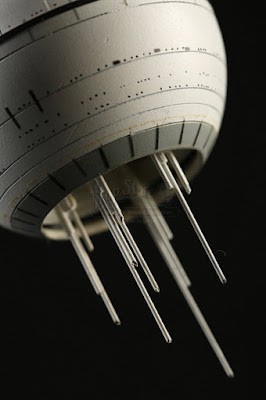 Below are some images of an attractive model miniature prototype, measuring approx. 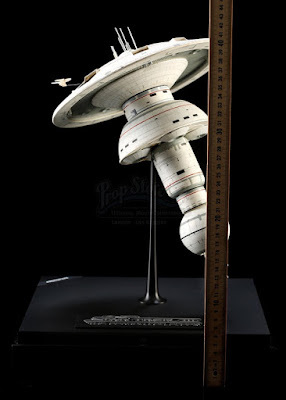 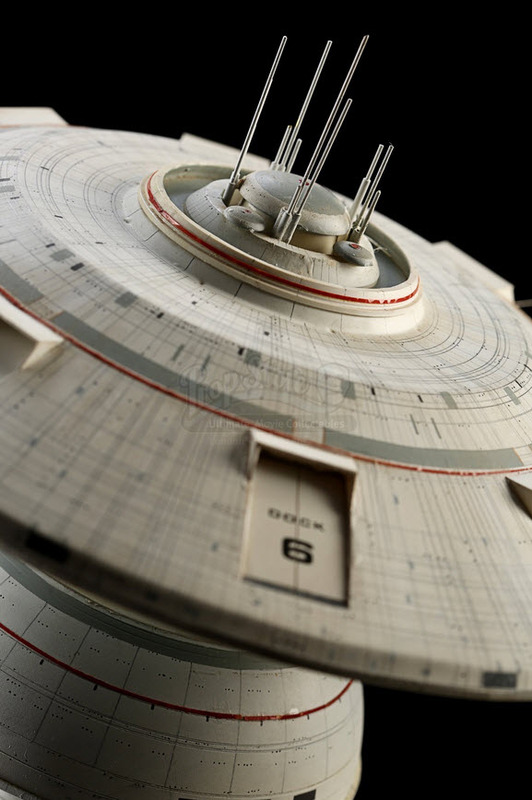 17.75" x 12.5" x 12.25", used for concept development / design approval of the Earth Spacedock filming model that was constructed for the third Star Trek motion picture, The Search for Spock (Paramount, 1984). 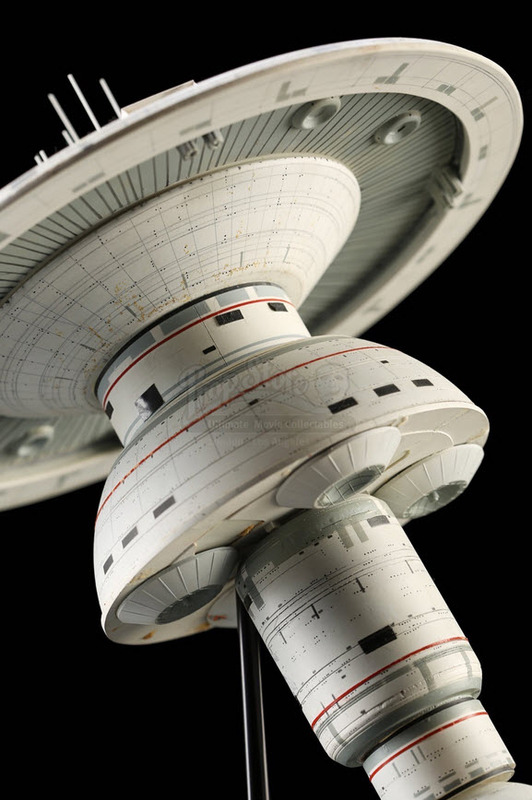 This mock-up is constructed from molded sheet plastic and features eight docking bays with a wire-supported paper Enterprise seen entering one of the open ports. The surface of the station features a fine grid-line pattern to simulate paneled construction which is similar to that seen in the final version of Earth Spacedock, and this prototype also features numerous antennas protruding from either end of the station, but of simplified design in comparison to the complex geometries seen on-screen. 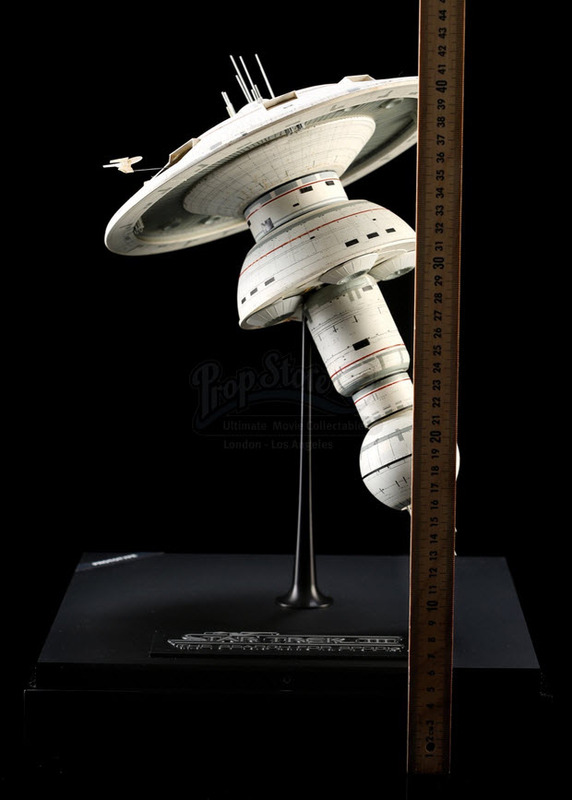 This impressive model was recently offered as Lot 341 in the Prop Store of London's September, 2015 "Treasures from the World of Film & Television" entertainment memorabilia auction that took place at the ODEON BFI IMAX theatres in Waterloo, London, England; where it realized a high bid of £5,000 (approximately US$7,650), not including the 29% buyers premium. 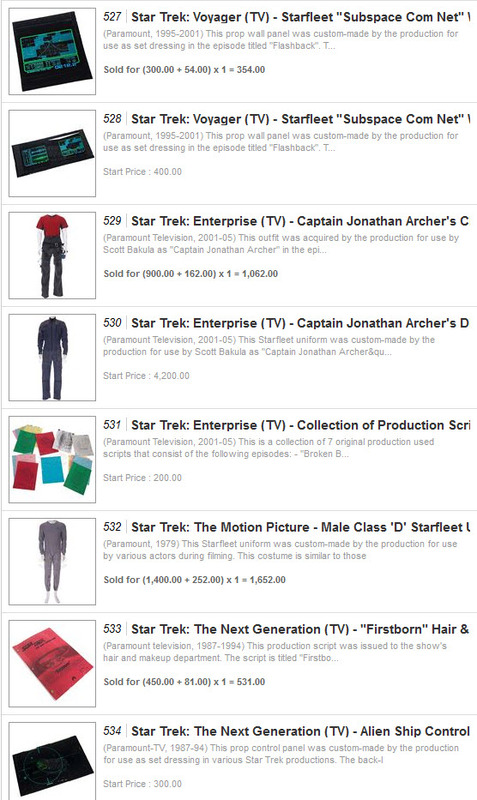 Some Spacedock screen captures from The Search for Spock are shown at the bottom of this photo study. 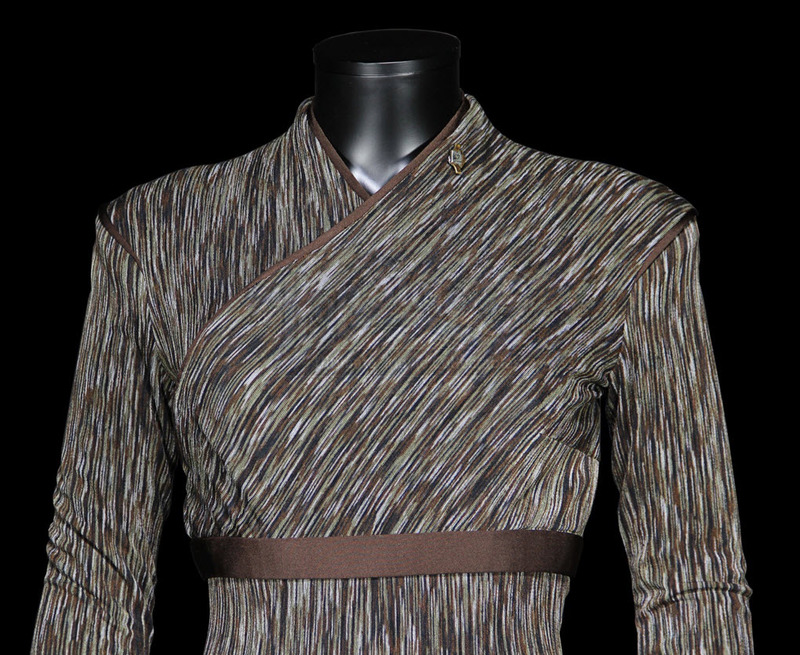 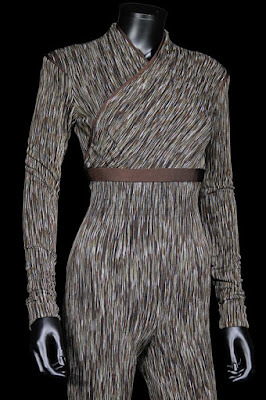 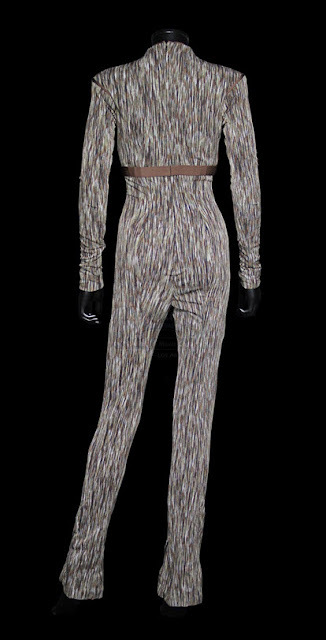 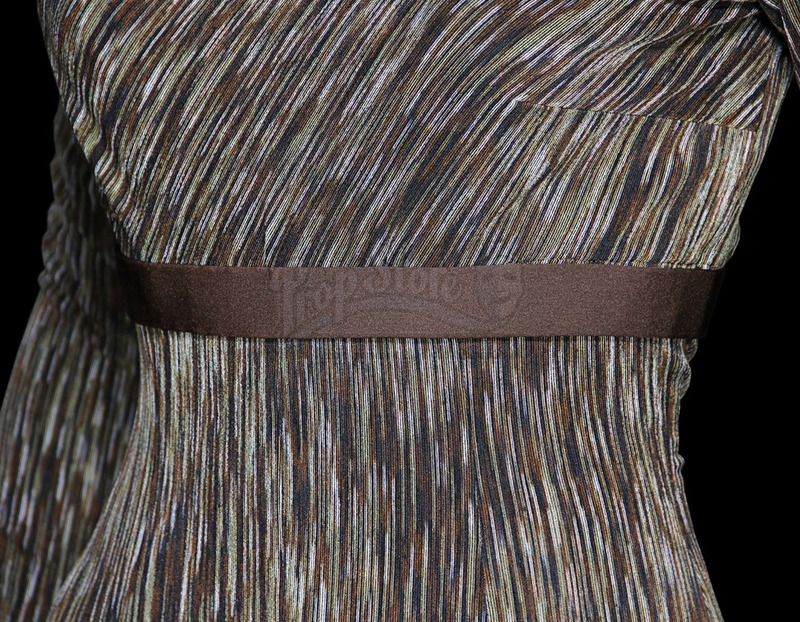 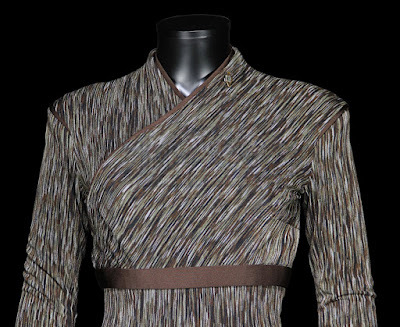 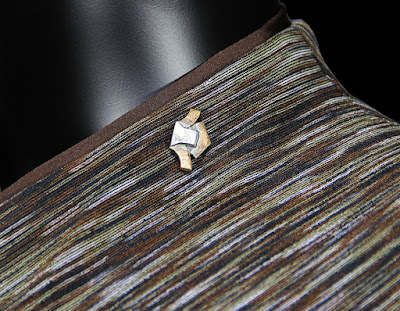 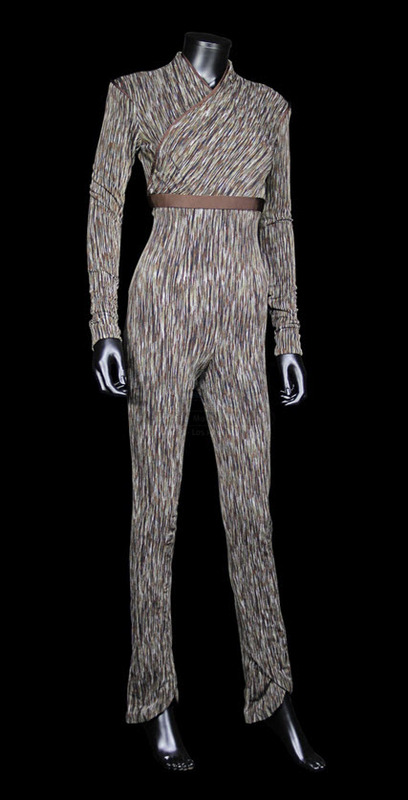 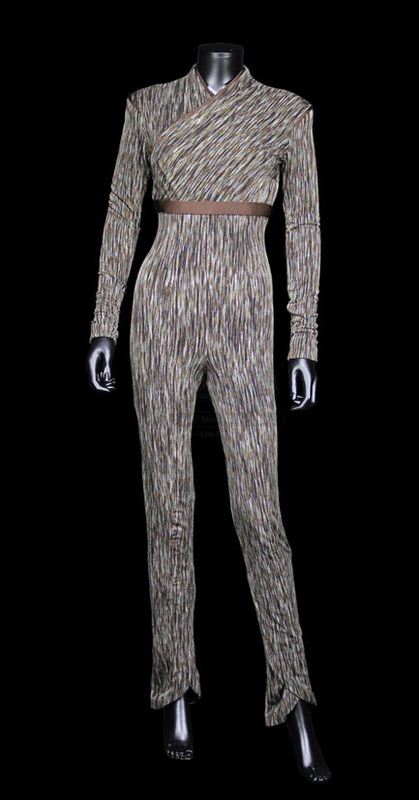 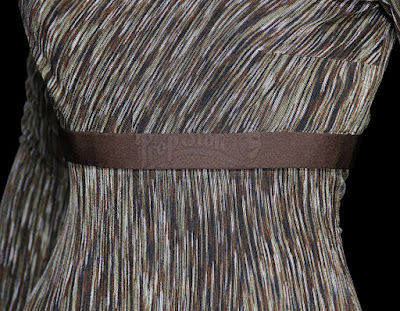 Presented below are some detailed images of a Jolene Blalock screen-worn T'Pol Vulcan uniform; constructed of the familiar brown, yellow, black and grey streaked form-fitting fabric that characterized her unique jumpsuits seen throughout the series pilot Broken Bow (first airdate: September 26, 2001) and the first two seasons of Star Trek: Enterprise. 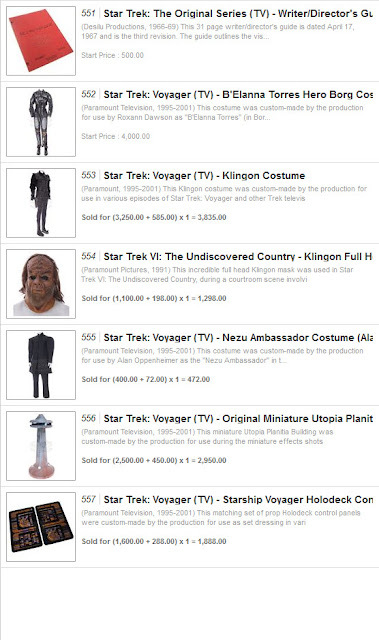 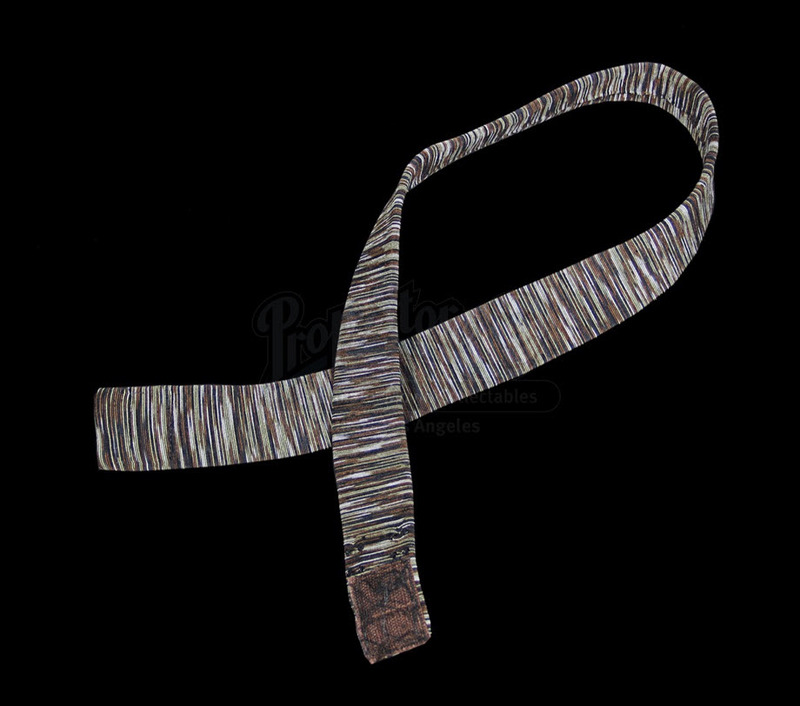 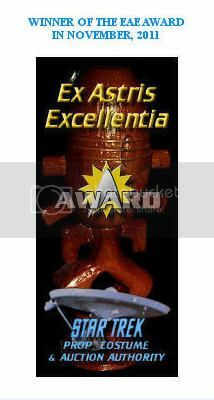 This costume features a hidden zipper running down the center of the back and a brown elasticized belt as well as an accompanying metal Vulcan emblem for placement on the collar. 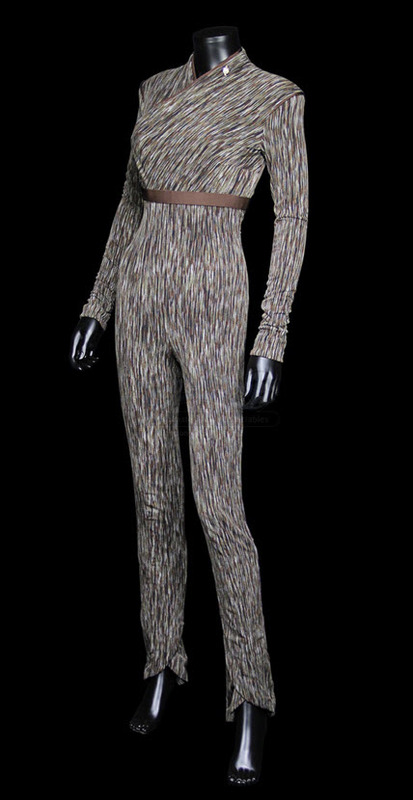 This iconic uniform was recently offered as Lot 357 in the Prop Store of London's September, 2015 "Treasures from the World of Film & Television" entertainment memorabilia auction that took place at the ODEON BFI IMAX theatres in Waterloo, London, England; where it realized a high bid of £2,000 (approximately US$3,060), not including the 29% buyers premium.